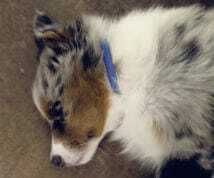 Jess is our new 10-week old Australian Shepherd. She's the dog of our dreams. Obviously, we were nervous about welcoming her. We had everything ready for her to feel good in her new home.ADAPTIL Junior is very easy to use. While going to get Jess at the breeder, we were a little worried. "How was the trip home going to be? Would she cry?" In fact, she slept like a baby all the way. The first night was calm, without any crying or whining. My last puppy had cried all night when he arrived, which was extremely distressing for everyone. This time, it's completely different. Our nights are peaceful, Jess is very calm, comfortable and happy.We are convinced that ADAPTIL Junior helped our puppy feel happy in her new forever home, which made learning easier and allowed us to quickly create strong bonds with Jess. 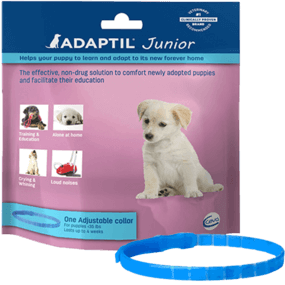 Having had five puppies before Jess but not knowing ADAPTIL Junior, I can say that now I can not live without it!